On and off in my life I’ve felt this disdain towards people telling me to appreciate “the simple things in life”. Quite often this has been at a point where I’ve felt sorry for myself and like my life sucked, was too hard or there was just no meaning to, well, anything really. I’m so glad to say I don’t have days like that anymore. It might still hit me for an hour or two. And now I have a way out. A way to stop myself from spiralling downwards. Wanna know the big irony? It’s about appreciating the simple things in life! HA! Back at me!!! It’s not “my inner self”, it’s not “who I truly am”, it’s not “my purpose”, “my core” or anything like that. It’s nature. Nature is simple. It’s always there. It IS what it IS. If it rains, it will rain. No matter what I think about it. No mater what I do about it, nature just is. And that’s the beauty. That’s the learning. Therein lies the answer. So these days, whenever I feel myself going down that negative spiral again, I stop. I make myself go outside and connect with nature. I don’t care in what way. Sometimes I swim in the ocean. Sometimes I look at the flowers on my lemon tree. Sometimes I watch the moon high in the night sky. Sometimes I sit on the wet morning grass. And in that moment, I’m fully present and I appreciate the simple things in life. Like the fact that I’m still breathing. That I have all of my senses intact and can fully take in the beautiful show that nature is, even in a suburb in Sydney. There is so much life going on around me. And when I connect in with that, there is just no other way than to appreciate it. So next time you find yourself feeling down about something, why not give it a go? Go outside and connect with nature in some way, any way. It works for me. Maybe it will work for you too? 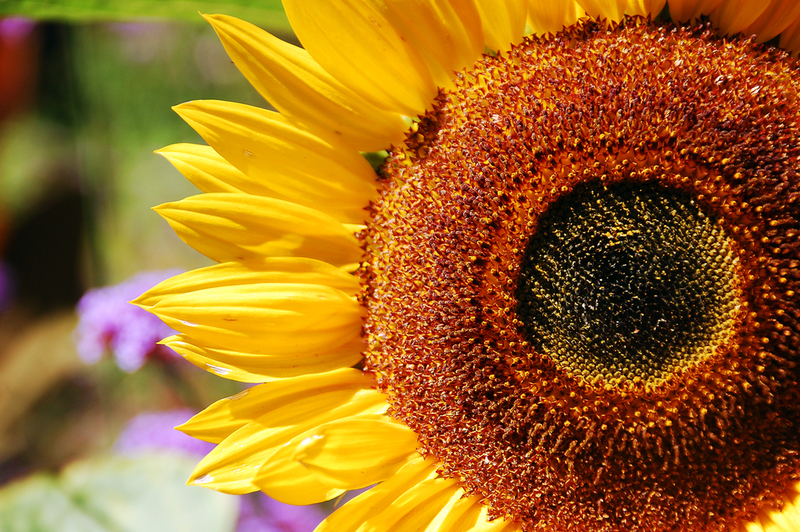 Sunflower – a simple thing to appreciate in life!